Controlling the relay is really simple. The relay uses a single pin for control. When floating or pulled low, the relay is 'open' or unset. When the pin is pulled high, the relay switches closed/set. A red LED next to the pin will let you know that the signal is high. You will need to solder closed a jumper on the bottom to match the pin you want to use for control. When the relay is closed it will draw approximately 100 milliamps (yep! 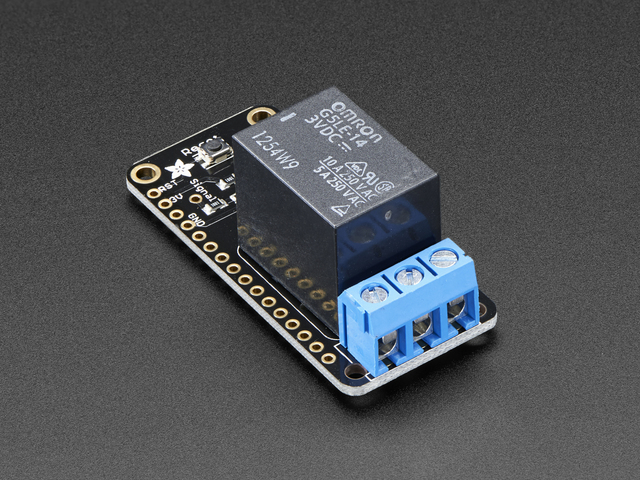 its a big relay and the voltage is only 3.3V) so keep that in mind when using a lot of accessories, sensors and devices on the 3.3V power line. The Wing has the power control output on the end, a 3-pin 5.08 mm terminal block. The COM pin is what you should connect the signal you're planning to switch. If the relay is unset, the NC pin (Normally Connected) is mechanically connected to COM. NO (Normally Open) is mechanically disconnected. This guide was first published on Aug 19, 2016. It was last updated on Aug 19, 2016. This page (Pinouts) was last updated on Apr 17, 2019.